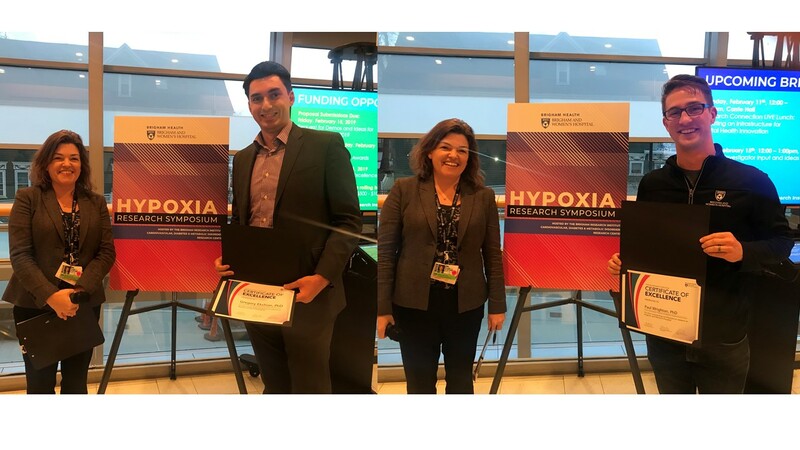 The Brigham Research Institute’s (BRI) Cardiovascular, Diabetes & Metabolic Disorders (CVDM) research center hosted its first Hypoxia Research Symposium to bring together clinicians and scientists working on various topics related to this dangerous condition that can have damaging effects on many different organs and tissues. The event consisted of four short talks from selected abstracts, a keynote presentation from professor William Kaelin, MD of the Dana Farber Cancer Institute, and a poster session. An engaged and enthusiastic crowd of over 35 people attended the symposium where research from four departments and seven divisions was presented, highlighting the cross-collaborative nature of the topic. Presenting on “The von Hippel-Lindau Tumor Suppressor Protein: Insights into Oxygen Sensing,” William Kaelin, MD, showcased several lines of research his lab has engaged in to elucidate the molecular underpinnings of cellular oxygen sensing. Spanning the divide from bench to bedside, his lab has made remarkable contributions to the field, including the identification of a druggable target to treat anemia: an inhibitor of EglN1, a 2-oxoglutarate-dependent dioxygenase, is currently being evaluated in clinical trials. The BRI and CVDM research center were honored to have such a highly regarded researcher serve as the keynote speaker. During the poster session that followed the talks, two outstanding posters were awarded with a prize of $250. Each selected speaker was awarded with $500. Congratulations to the winners!